Welcome back to our hookah hacks blog. In order to ensure that your hookah experience, whether you’re with us at Hookah Spot or not, is always awesome, we’ve provided a collection of our best tricks to improve your smoke. In our previous blog, we discussed how we recommend coping with dried out shisha, starting your hookah up faster, and smoking without a grommet. 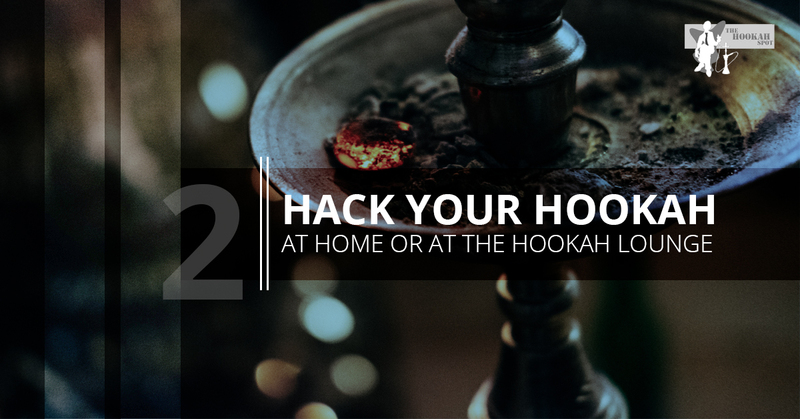 In this blog, we’ll talk about the rest of our tips and tricks that will ensure your smoke is just as good at home as it is right here in our hookah lounge in Columbia. Hookah With A Broken Base? While a cracked or broken base on your hookah is never great for the optimal smoking experience, it’s still workable. The quickest way to adjust this issue is by placing the broken base in a large bucket and then filling that bucket with water. Make sure that the water line reaches past the crack in your base so that the tension of the liquid can keep the water in your base within. You can then set the rest of your hookah up like you usually do. The pressure of the water inside and outside will press the gap closed essentially, removing the leak entirely. This comes as a shock to many veteran hookah smokers but you can actually increase your airflow by merely modifying your mouth tips. Start by inserting the mouthpiece into the hookah hose and take note of how far you insert the mouth tip inside before it’s properly sealed. Then, remove the mouth tip and cut the tip just past the point where you noticed the seal happens. You’ll notice the mouthpiece tapers down to provide a better fit for a variety of hoses, thus by adjusting it, you’ll get a better fit and better airflow that will increase your smoke. Over time, hookahs can start to decay and lose some of their integrity, but this does not mean that you’ll have to sacrifice your smoke or get a new hookah entirely. It merely means you’ll have to adapt to its needs a little. If your base and stem start to lose connection a little, start by taking the base grommet off of the stem and then wrap the stem where the grommet would be with electrical tape. Reattach the grommet and then try and test the seal with your base. If it’s still not fitting snug add another layer of tape and repeat this process until the seal is adjusted properly. If it becomes too tight, remove the base grommet and try electrical tape instead. The seal will still be structurally solid but will fit better and is more adjustable. As your dedicated Columbia Hookah Lounge, we strive to provide a better smoking experience than anywhere else, whether you’re in our lounge or at home with some of our Tangiers shishas. These tips are here to improve your smoking knowledge and experience so that you can find the hobby as fulfilling as people have for thousands of years before any of us existed. Contact us if you have questions about which flavors of Tangiers we offer and more.